Wado-Ryu which means The Way of Peace and Harmony was developed by Hironori-Ohtsuka, to whom we owe a great debt of gratitude. This form of Martial Arts is experienced through an open focused mind, alert awareness and a committed approach. 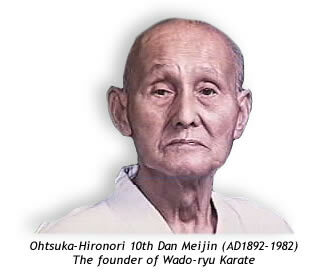 Wado Ryu is a style of Karate developed by Ohtsuka-Hironori 10th Dan Meijin (AD1892-1982). Wado combines traditional Japanese Budo, Okinawan Shuri-te (To-de) and Shinto-Yoshin-ryu Jujutsu, and was recognised as an independent style in 1934. Wado-ryu is reputed to be one of the fastest and most efficient forms of Karate in the world; emphasis includes the fundamental principles and concepts of 'Nagasu, Inasu, Noru, and Irimi'. The founder was responsible for introducing partner-work routines to Karate. Wado-ryu was also the first style of Karate to practise Jiyu-gumite (free-fighting) as part of the training. There are estimated to be over 350,000 Wado-ryu members practising in Europe alone.